IF YOU WANT A BANGING, BLOCKBUSTER BODY IN 3-D, THEN KICK IT TO THE CORE! Hey All-I am so excited to be teaching a new Core Transformer 3-D Matrix total body core workout at Up Dog Fitness Studio in West Hollywood. It’ll be nice to have a place to teach a class regularly or “door” as they call it in PR to hang my hat and torture clients while getting paid..LOL. 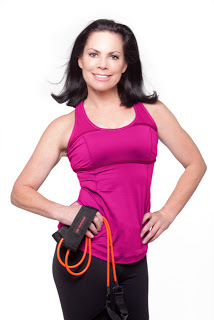 Here’s our press release: Celebrity trainer and core guru, Linda LaRue brings her 3-D Matrix total body core performance workout to Up Dog Fitness Studio in West Hollywood. So, if you want a banging, blockbuster body in 3-D, then kick it to the core with the Core Transformer® classes, beginning Saturday, June 16, 2012 at 9:30 a.m. The Core Transformer® total body core workout burns mega calories — up to 1,000 calories — and builds muscle too, giving you flatter, fitter abs and a ripped toned physique. Core Transformer 3-D Matrix This class is a dual, mega-watt, calorie-burning and muscle-building workout. It uses super-long, engineered specialty resistance bands combined with athletes’ performance, Pilate’s and yoga progressive movement sequences. This workout will engage all your major anatomical muscle slings or planes of motion. You’ll target and train every muscle in your body from the inside out — beginning first and always from your core — to truly transform your entire body … fast! Note: To reserve your space and get pricing, call Up Dog Fitness Studio at 310-360-7200. First class is complimentary. Certified athletic trainer, Linda LaRue LaRue, RN MEd, ATC, is one of the leading females in the health and fitness industry, specializing in a core performance training. She’s worked with a plethora of celebrities; plus, she’s a registered nurse and athletic trainer with a master’s degree in Exercise Physiology and Sports Medicine from the University of Virginia (UVA). She is the creator of the Core Transformer® kit, which features an abdominal workout DVD and specialty resistance exercise bands. Search engine Yahoo! Shine and Cooking Light magazine named the Core Transformer kit as “One of the Best New Workouts of 2011.” Recently, LA fitness gear reporter, Roy Wallack, of the LA Times gave the kit a positive review with no dislikes, which is virtually unheard of. Visit www.CoreTransformer.com/store to learn more and order a Core Transformer kit today.